Make sure you keep reading! GIVEAWAY at the end of this post for you! The 100 or so different shades of nail polish art from Incoco follow the trends of the seasons, and look incredibly authentic on your nails! 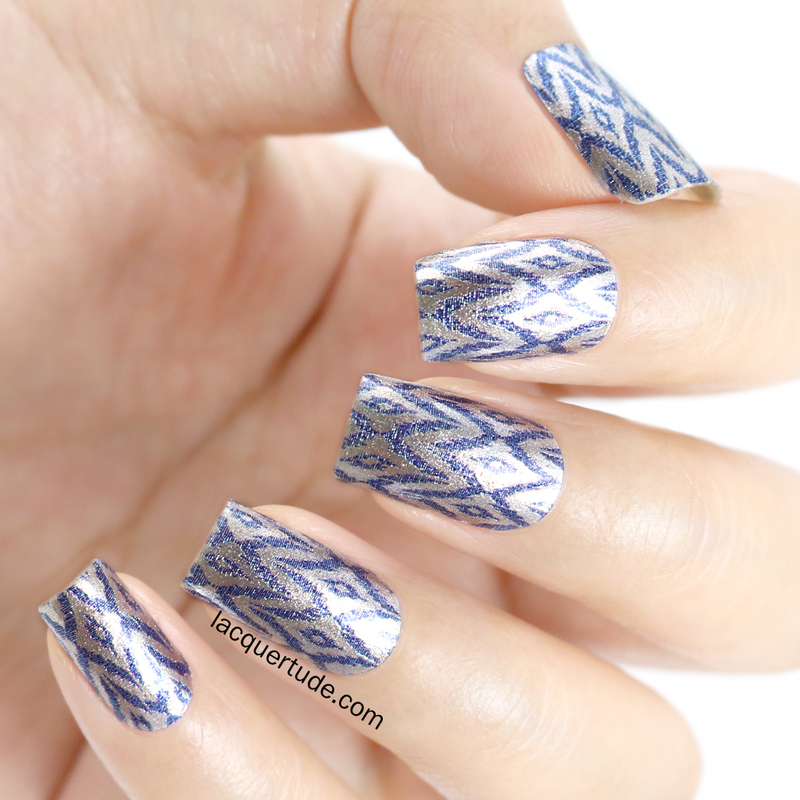 Instead of having to use nail art tools and crazy techniques to get cool designs, you can easily apply our nail polish strips for intricate patterns in half the time! You don’t have to worry about the mess or dry time! And, getting your manicure to match perfectly on both hands is a piece of cake! This brand carries such a wide variety, from solid color nail polish strip to intricate, gorgeous and fun nail designs, french manicure, design french manicure, and pedicure strips! And another bonus, all Incoco nail strips are made of real nail polish expertly crafted with 3 layers: base coat, color coat, and top coat. So all you need is to dress your bare nails with these nail strips and you’re good to go! 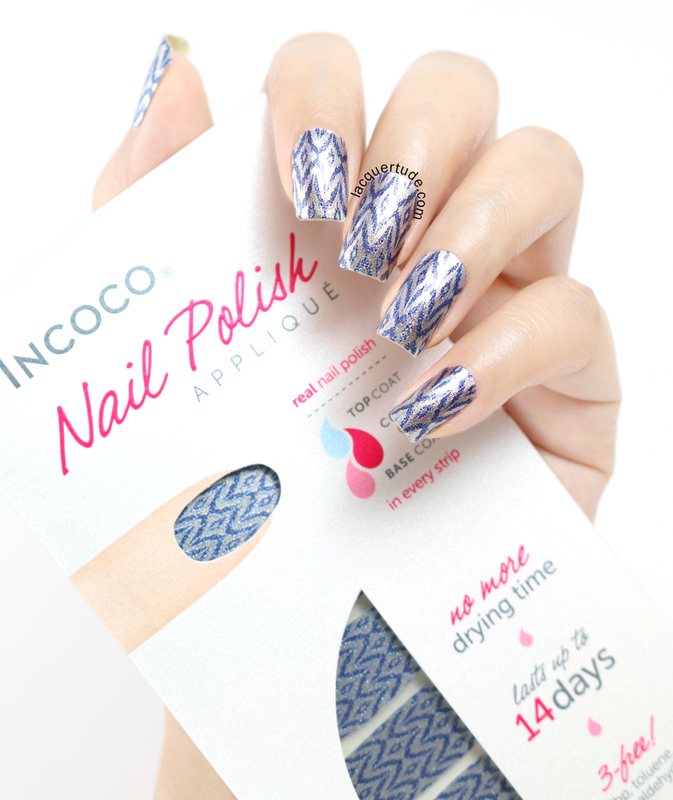 Compared to some other nail polish strips that I have tried before, my first experience with Incoco nail designs was beyond pleasurable. I would highly recommend them to anyone, so let me show you what the fuss is all about! You can see how well the strips fit around my cuticles. The only one I needed to trim was my thumb because it’s the only nail that has sort of a square-ish cuticle shape compared to the rounded shapes of my other nails. There’s no other product used besides the polish strips – that’s right, no base coat and no top coat! First, a further away shot so you get the effect of what they would look like to normal people. I can definitely see the tip wear, especially around the corners of my free edge. But, for someone like me, this result is really amazing since at work, most of the time I’m typing on a computer or running around setting up rooms, banging my hands into game and exercise equipment; and at school, I do even more computer work. Now it’s time for the Incoco Giveaway!! 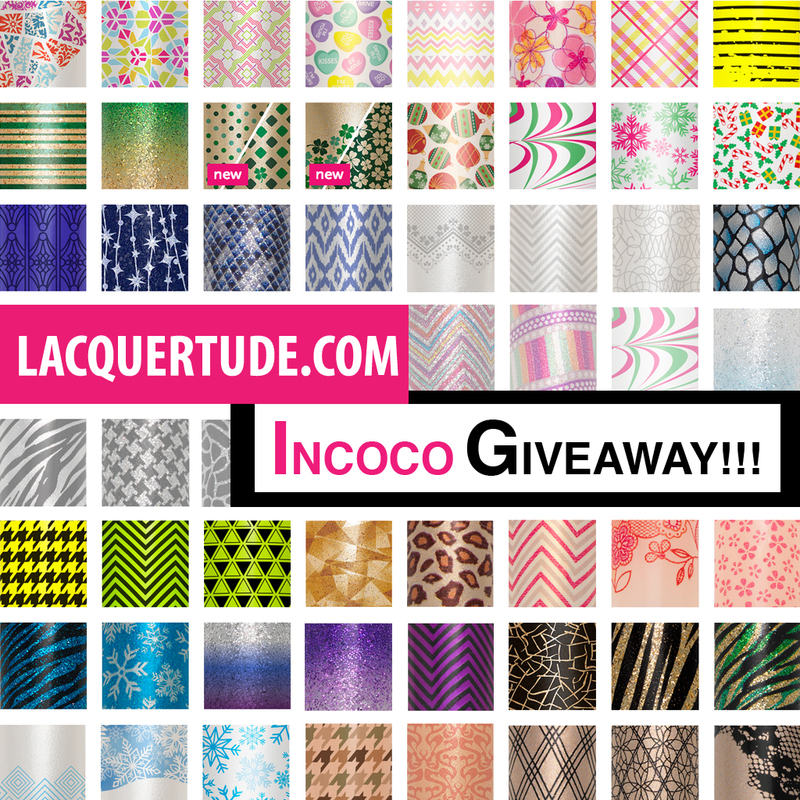 I’m beyond excited to share my new found love of the Incoco nail strips by hosting my first blog giveaway! 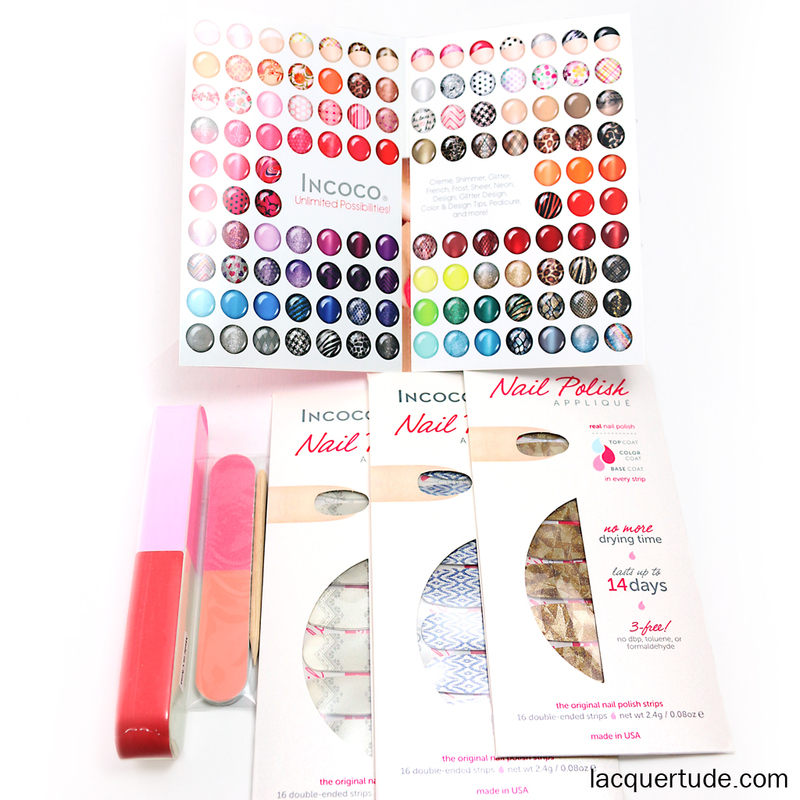 One winner will get one set of Incoco Real Nail Polish Appliques of their choice. The giveaway is open to all US and Canada residents, effective now until March 17, 2014, 12:00 A.M. Pacific Time. The winner will need to respond within 48 hours or a new winner will be chosen. See full Terms & Conditions in the Rafflecopter widget. Besides sponsoring the generous giveaway, Incoco has also provided all of my readers with a 15% Incoco promo code: LACQUER15, effective until March 17, 2014. If you want to get something now before my giveaway ends (like those new St. Patrick’s Day designs that I’m eyeing), then just enter the above code in the promo code box at checkout. To share this giveaway, please use the picture below and link back to this post. Have fun shopping and GOOD LUCK!!! I would love to see a marbling nail art tutorial. I am having real trouble making it work for me, and any tips would be appreciated! Hi Kam! I’ll see if I can get my hands on some Sinful Colors, they’re not as easy to come back in my area in Canada…but I’ll do my best! Thanks for offering such a pretty prize! I just tried Sally Hansen strips for the first time, and would love to try out Incoco next. My pleasure, Aquariann! I wonder how the two brands will compare to you…so best of luck! I love reviews and tutorials. Thank you for the giveaway!! Great! I’ll work on bringing you new reviews and tutorials 🙂 You’re very welcome and good luck! Thank you for hosting this fab giveaway! Thank you for running this contest! Your log is lovely! I’d love to try these! I’ve only tried one brand of nail wrap before, from a Kickstarter, so I’d love to try a “real polish” brand! I think you’ll love it! Let me know how you like these if you end up trying them and good luck! I would love to see a battle of the textured polishes. How they differ and who does it best. Oh…you caught me! I must confess that I don’t own any textured polishes…I enjoy smooth nails so I haven’t worked up the courage to try them…maybe one day?! I love nail art any kind lol =) Hope you had a great Monday <3 Thanks for the chance to hopefully try them lol I didnt know they had so many styles!! I’ve tried Incoco before & ended up loving them even though I didn’t think that I would. I love this design since there is no way I could create this look on my own. http://www.incoco.com/camouflage-nails-tailored-fit Thanks for all of the hard work that goes into your blog! Awesome giveaway! Thanks!! Hope to win!! Would love to see more giveaways! These look so cool- would love to try them out- great giveaway and nice little blog you have! would love to win!! thanks for the giveaway! I’ve never tried nail polish strips before, but it’s a very cool and exciting concept! But I also want to brag about my own nail art, so you see where my problem lies. 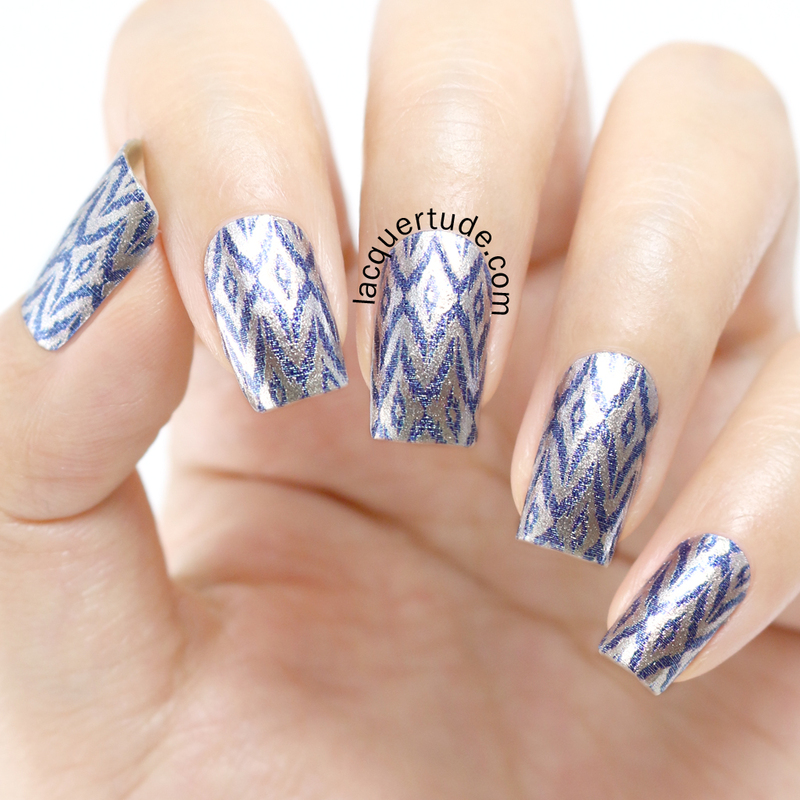 I usually prefer painting my nails with regular nail lacquer, but the designs these nail strips have are just beautiful. I might just have to order some and try them out. Thank you for the review and giveaway. I’m really interested in a review on the O.P.I. Sheer Tints. Nail art using them w/ a tutorial would be great too! xD Thank you for having the giveaway!